“Should I apply a foliar fungicide and if so, when?” is a question North Carolina soybean growers struggle with every year. Application of a foliar fungicide can help reduce disease pressure and protect yield potential, but they are costly. With low commodity prices, growers are looking to reduce costs. Are fungicides a smart investment? To begin to answer that question, the North Carolina Soybean Producers Association funded research through the soy checkoff to investigate fungicide application and timing over the last two years. A three-article series beginning with this post will explore how and where the research project was conducted, what the results were and what that means for farmers. The research was carried out by a group of crop consultants across Eastern North Carolina. Trials were conducted in 2014 and 2015 across 5 locations, two in the tidewater region with high potential yields and three in the coastal plain region with moderate potential yields. 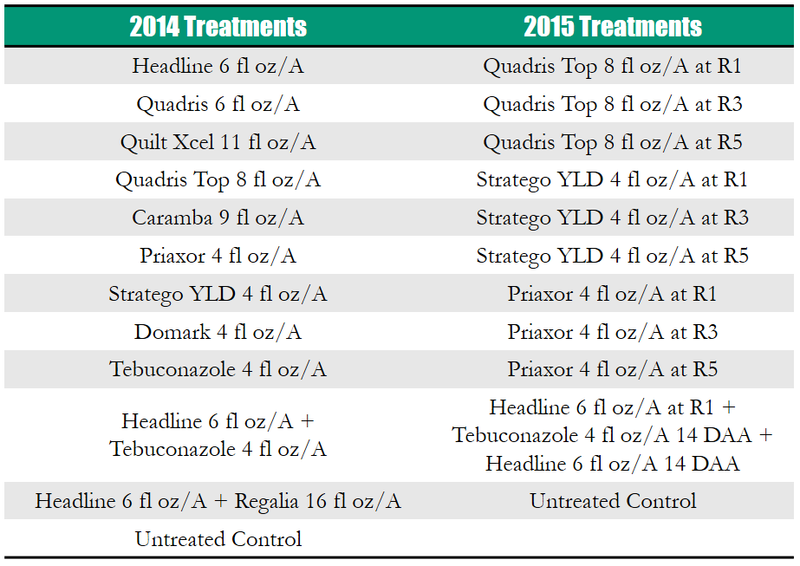 In 2014, 11 different fungicide treatments were compared at the R3 stage. A group V variety with little frogeye leaf spot (FLS) resistance, Pioneer 95Y40, was planted at each location. In 2015, four different fungicide treatments were compared across three different application times, R1, R3, and R5. In the Coastal Plain locations, Asgrow 6834 (group VI) was planted, and in the Tidewater locations, Pioneer 49T80R (group IV) was planted. Both 2015 varieties have moderate tolerance to FLS. In both the 2014 and 2015 experiments, yield, green stem at harvest and disease incidence were collected and compared to the check to determine the effect of each treatment. Check back next week to find out what the results of the 2014 and 2015 studies were.